The Acura ILX is basically the last-generation Honda Civic Si with an ostensibly more luxurious badge and a slightly nicer interior. What do you need to know before you buy a Acura ILX? Don’t worry, we’ll tell you everything right here in our Buyer’s Guide. The ILX is Acura’s entry in the lucrative small premium compact segment, but its Civic underpinnings keep it from being a real contender against metal like the BMW 2 Series or even the Mercedes-Benz CLA. But it’s not a bad car! Just not a very competitive one, if its sales numbers are any indication. Don’t expect a return to Integra or RSX glory here. But while it’s not the strongest choice in the segment, it is a safe one that boasts Honda reliability with below-the-radar styling. A round of powertrain changes since the ILX’s debut indicates it’s had trouble finding traction in the market. We came away pleasantly surprised by the 2.4-liter iVTEC, manual-equipped ILX we drove at Honda’s Mid-Ohio School. Though that car had minor upgrades for track duty, it proved to be willing in the rev department, reasonably quick, and with sharp handling for a front-drive sedan its size. The six-speed manual was also a pleasure to use, as they tend to be from Honda and Acura cars. Unfortunately, that powertrain combo no longer exists, as Acura dropped the manual option due to the low take rate at dealerships. In its place is a 8-speed dual-clutch automatic with manual shifting mode. The old base 2.0-liter engine is also gone, replaced by the larger 2.4-liter unit only. The new car is said to be a bit quicker, but we’ll miss the feel of the manual. The Acura ILX made its production debut at the 2012 Chicago Auto Show. That car launched as a 2013 model and was based on the ninth generation Civic platform. Despite the common platform, the Civic and ILX actually share very few exterior components, Acura’s attempt to convince people that this isn’t just a prettied-up Civic. The 2013 model came with three engine options: a 111 horsepower 1.5-liter I4 hybrid with a CVT automatic, a 150 horsepower 2.0-liter I4 with a five-speed auto, and a 201 horsepower 2.4-liter I4 mated to a six-speed automatic or six-speed manual. For 2014, Acura updated their leather interior, made heated seats standard across the board, added a standard eight-way power driver’s seat, and made 17-inch alloy wheels standard and a rearview camera standard. The next model year got rid of the hybrid option, and 2016 introduced a new look with fresh LED headlights and updated front and rear fascias. The 2.0 goes the way of the Do-Do, making the 2.4-liter inline-four the standard engine. That engine ditches both the six-speed auto and manual transmissions in favor of an 8 speed auto. There are also new driver’s assist features for 2016. Powertrain options for the ILX have dropped since the car’s debut. There’s no longer a hybrid 1.5-liter bolted to a CVT. There’s no longer a 2.0-liter mated to a five speed, and even the 2.4 loses its manual transmission option for 2016, leaving the 2.4-liter and eight-speed dual-clutch auto as the sole engine/transmission coupling. The 2.4-liter makes 201 horsepower and 180 lb-ft of torque, up 10 lb-ft from last year. That power is routed to the front wheels through the eight-speed auto, and will probably get the 3,100 pound car to 60 in around seven seconds. Fuel economy is decent for the segment. The heavier CLA gets 38 on the highway and 30 combined, but the even heavier 2 Series manages only 28 MPG combined, so the ILX is right where it should be. The 2016 Acura ILX comes in six trim levels: base ILX, ILX with AcuraWatch Plus, ILX with Premium Package, ILX with Premium and A-SPEC Package, ILX with Technology Plus Package and ILX with Technology Plus and A-SPEC package. All trims get a 2.4-liter 201-horsepower inline-four, an eight-speed dual-clutch automatic transmission, front-wheel drive, a MacPherson Strut front suspension and multi-link rear, 12.3-inch vented rotors up front, 11.1-inch slotted discs in the back and electric power steering. ILX w/AcuraWatch Plus: Starts at $29,200. 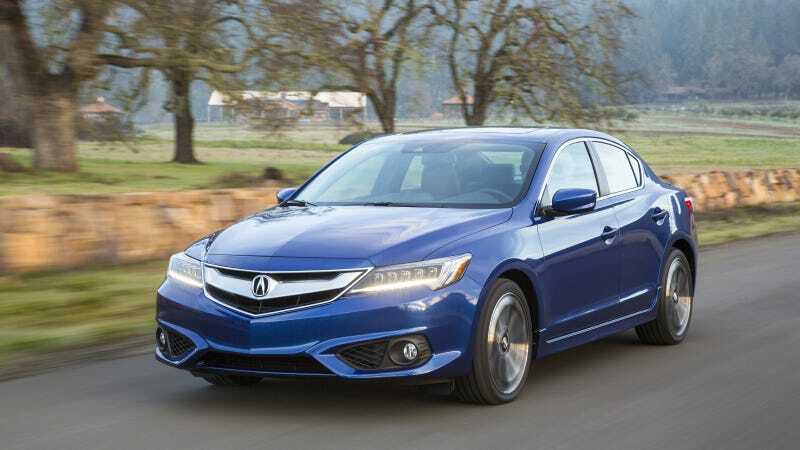 Notable standard features over base ILX: Collision Mitigation braking System, Adaptive Cruise Control, Lane Keeping Assist System, Road Departure Mitigation and a color multi-information display. Similar options as base ILX. ILX w/Premium Package: Starts at $29,900. Notable standard features over ILX w/AcuraWatch Plus: Blind Spot Information System, Rear Cross Traffic Monitor, auto-dimming rearview mirror, eight-inch VGA display for infotainment system, leather-trimmed sports seats with driver memory, power passenger seat, seven-speaker premium audio system with subwoofer and satellite radio, Navigation capability. Similar options as base ILX minus satellite radio. ILX w/Premium and A-SPEC Package: Starts at $31,890. Notable standard features over ILX w/Premium Package: fog lights, side sills, a rear spoiler, 18inch alloy wheels, aluminum pedals, Suede seats and unique interior trim. Notable options: 18-inch unique alloy wheels ($1,700); remote start ($399); A-SPEC aero kit: front and rear underbody spoilers ($900); auto-dimming mirror ($234); backup sensors ($264). ILX w/Technology Plus Package: Starts at $32,900. Notable standard features over ILX w/Premium: Acura Navigation System with real-time traffic, 10-speaker premium audio system, voice recognition system, GPS-linked and solar-sensing dual-zone automatic climate control, guidelines in rearview camera, AcuraLink phone integration. Similar options as ILX with Premium Package. ILX w/Technology Plus and A-SPEC Package: Starts at $34,890. Notable standard features over ILX w/Technology Plus Package: fog lights, side sills, a rear spoiler, 18inch alloy wheels, aluminum pedals, Suede seats and unique interior trim. Similar options as ILX w/Premium and A-SPEC Package. The ILX with Technology package stands out as a good value. For $33,840 all in, you wind up with a luxurious, fuel efficient car that gets a whole slew of driver’s assist features, leather seats and plenty of other nice tech. Pay that much for a Mercedes CLA and you’ll wind up with a much more spartan automobile. If we could have any ILX, we’d take the one with a manual, but that will mean a trip to the used car lot—if you can find a manual version, anyway.